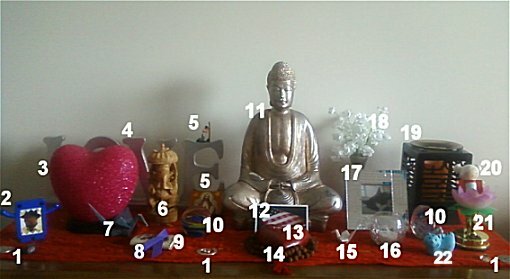 I have a feeling that a lot of people may not like the setup of my shrine because it doesn't necessarily fit with all Buddhist beliefs. It's secular, not completely Buddhist and features elements of Hinduism and Christianity. I am perhaps showcasing my attachment to material possessions, but this setup works for me, and I love it. Below are descriptions of what appears here and why. Metal Trinkets and Quartz-I placed some metal trinkets and two pieces of quartz to hold down the scarf on which everything sits because the edge of the scarf kept flying up. The pieces of quartz were given to me by a boy that I taught English to. This was my first real experience doing volunteer work, and I've place these here as a reminder to always be compassionate and help others. The metal trinkets contain optimistic sayings and remind me to stay positive because I am sometimes too pessimistic. Domo Monster Picture Frame with a Picture of Ricky- Not too long ago, I realized I'm an angry person, and Ricky is too. Although Domo is a nice monster, he looks angry. If he does get angry, he farts, which incidentally is the same thing Ricky does, usually when we're both enclosed in my car. This is a reminder that we must practice patience with the ones we love. This picture frame was a toy that came with a Taco Bell bean burrito. Yes, Taco Bell is my guilty pleasure. Heart Shaped Lamp- I bought this lamp about 10 years ago at Target. For a while it lit my college dorm room at night, but after that it was just collecting dust. I like the heart shape as a representation of love. It's also nice because this lamp stays very cool, lights up my Buddhist shrine at night and is not a fire hazard. The upgraded version is for sale here . Love Sign- This sign has been hanging around my room for the last 15 years. It's a reminder to love others. I spray painted mine silver, but the original is available here . that came from a 25¢ machine when I was one my first adult vacation. I don't know if these dolls are still sold in vending machines, but you can buy Homies here . Below is an orange matchbox with an image of Jesus on it and Christian religious articles inside. This was sent to me in a Swap-Bot Swap. I keep these here because Christianity was my first religion. Christianity made me who I am today. I never want to forget that. Ganesh Statue- This Hindu god was a gift from one of my Hindu friends when I moved to this apartment. Hinduism was the beginning of my exploration of other religions. Origami Paper Crane- This was given to be me by my brother years ago. I like it because my brother is a great origami folder, and the crane is a symbol of hope and peace. The paper crane has become more relevant following the tragedies in Japan. Domestic Violence Awareness Ribbon- One of the victims' advocates gave me this one day in court. I always kept it because, although I defended many domestic violence cases, I believe that domestic violence is a terrible problem that needs to be addressed. Handmade Paper Journal- I keep this here as a reminder to read, study and be mindful. Represents scripture. I found this treasure at Acacia in Ft. Lauderdale. My Grandfather's Paperweights- When my grandfather died, my grandmother gave his collections of paperweights and snow globes to his grandchildren. My grandfather was my first example of someone who believed in liberal religion. At his funeral, the pastor said something about my grandfather believing in God and being in heaven. Afterwards, my grandmother was irritated because she said that my grandfather didn't believe in God. My grandfather did have spiritual and religious beliefs, but they just didn't fit with his church. Buddha Statue- I got this a few years ago when I began my Buddhist practice. Memorial Card- This is a memorial card from the funeral of a murdered friend. He was a great man who was a veteran and gave himself to helping others. I save this card because it's patriotic and because my friend was an example of how we can improve this life. He was one of my greatest teachers. Heart Shaped Paperweight- With the word "pray" carved into the front, this paperweight is mainly a holder for my mala. My mala looked carelessly thrown around and fell a few times before I secured it with this weight. Rudraksha Mala- I use this in meditation. I've seen rudraksha malas used more often at the Hindu temple than among Buddhists. Personally, I like the texture of the beads because you can really feel them between your fingers. Like everything else that is impermanent, they become worn with use. I got this at Hoa Oriental Gift Shop in Miami. Get your own rudraksha mala here . White Crane Chopstick Rest- This found a place here when I quit my job and moved everything from my office to my house. I got this at Sasaya, which has the best ginger salad dressing in all of Ft. Lauderdale. The food is amazing, athough most people don't even realize there's a sushi bar there. If you're not local, get Japanese crane chopstick rests here . Electric Candle- Many Buddhist shrines and shrines feature some type of candles, butter lamps or light. I chose an electric candle for safety reasons. This candle illuminates the picture of my deceased cat Zenith. Picture of My Deceased Cat Zenith- He was like my child. He became blind in the middle of his life, but he always remained cheerful and active. I really felt a loss when he died. It was about three months after his death that I first attended Buddhist religious services. I didn't feel that Christianity adequately addressed what happens to pets after they die. I still miss Zenith a lot. Flowers- Flowers are placed on many Buddhist shrine to represent the impermanence of life and also generosity. These flowers are cloth because I'm allergic to pollen. Scented Oil Warmer- This was a birthday gift a few years ago from a friend. It lights up a nice orange color, which lights the shrine at night. Many Buddhist shrines contain perfumed water or incense. I choose scented oil because incense irritates my lungs. Momiji Doll- I bought this Momiji doll when I quit my job. She is named Blanche and designed by Adolie Day. I got mine at Jezzebel in Ft. Lauderdale, but if you're not local, you can buy Momiji dolls here . I think that this is what the future version of me might have gray hair and be at peace. The outstretched arms are a reminder to love all beings. Lotus Lamp- I bought this lamp at a dollar store at Bayside about 10 years ago, but the Buddha Lotus Light is the closest thing I can find now. The Momiji emerging from the lotus represents a desire to obtain enlightenment and leaving delusions behind. Tiger Bell- Many Buddhist shrines have a representation of sound on them. I like this bell because it's informal and not so serious. I got it at Miami China City, which is a great store. I'm hopping over from the I Love My Online Friends blog hop. Thanks for visiting and following my blog. I'm a new follower! I very much like how you incorporated all the items that have value to you onto your shrine! Don't worry what other people may think, so long as it is how you like it to be. It's nice to have possessions that have so much meaning behind them! Thank you for visiting my blog, Lola! Hi Lola! Thanks for the follow and what a lovely shrine you have there! @Sofan and Melody, I completely agree. I think the reason that many people give up on religion or don't follow religion as closely as they could is because some religions are too wrapped up in dogma, rather than being concerned about the big picture. Thank you all for your nice comments. interesting to post that gives us a better idea about a personalised shrine. like the rest have said, it doesn't matter at times if others like it because when it comes to religion, it's a personal and spiritual issue. dropping by from much love monday! I think it is really cool that you have Domo in your shrine.